In 1986, Marg Scott, a young woman with a vision and love of animals wanted to share her passion with the community when she opened up her own pet grooming salon in her home. Over the next several years, through training and volunteering, she continued to perfect her trade and TLC was born. In 2001, TLC went storefront and grew in both retail and grooming as well as sharpening and repairs of grooming tools. In 2005, TLC became Ottawa's regional distributor of the Hokamix line of wellness supplements. Our exclusive lines of products continued to grow including the Les Poochs line of products, Oxyfresh and Eye Envy. Like all of our other products, these are holistic and safe for your pets as they contain natural ingredients and do exactly as they claim. In 2014, Marg Scott, founder and brainchild behind TLC passed away. 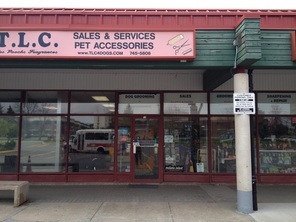 The business was taken over by an individual who shared Marg Scotts vision and love of animals. Marg had many ideas and goals she was unable to reach due to her passing. TLC's mission is to continue to fullfill those goals as well as continue to provide top quality service and provide clients and their pets with the best possible products that are not only safe but effective. Unlike the big box stores who provide several gimmicks, tons of marketing and offer grooming as a "service", our business is built on pet grooming first and foremost and we take great pride in our work, our staff and client satisfaction. We do the little things. In this day and age where money takes a front seat to customer service and client satisfaction, we refuse to go down that route. Our love for animals and people as well as our strong ethics play a huge role in who we are. Call us a "rare breed", but at the end of the day, what brings us satisfaction is knowing you and your pet leave TLC with a smile on your face. As a result, TLC will continue to take pride in good old fashioned service and treat every pet that comes through our doors with the same love they have received over the last 30 years. TLC is not just a name, but a standard we hold dearly from the day we opened and every member of the TLC family stands by this. TLC will continue to carry on Marg Scotts legacy and make her proud. In 2017, TLC grooming moved to its brand new salon at 906 Shefford Rd. We continue to fulfill Marg Scotts dream and will continue to be the very best at what we do.